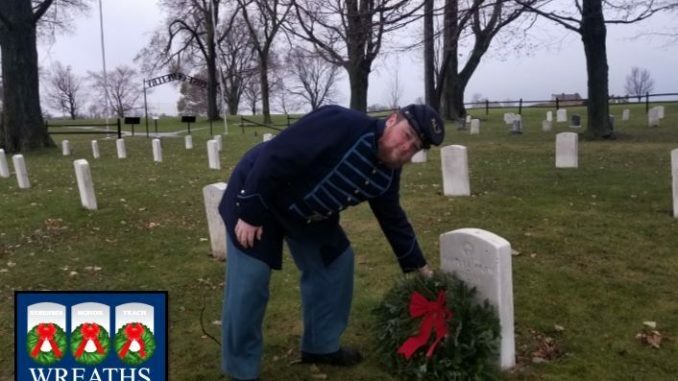 OSWEGO, NY – The Post Cemetery at Fort Ontario will join in the effort to support the mission to “Remember, Honor and Teach” as an official location for Wreaths Across America on Dec. 15. 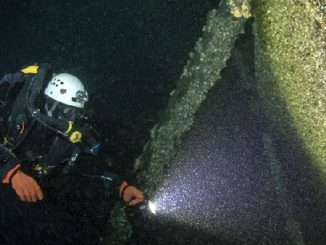 Under the coordination of AmeriCorps member Corey King, this will be the first year that Fort Ontario will participate in this national event. The Post Cemetery is the resting place of 77 soldiers who served at Fort Ontario between 1756 and 1943, as well as women and children who lived at the fort. “Our goal for Fort Ontario was to raise enough sponsorships to have 77 remembrance wreaths placed on the headstones of all the heroes laid to rest in the Post Cemetery. We have successfully reached that goal for this year, ensuring that the individuals who served to protect the freedoms of our country are never to be forgotten,” said King. Members of the community will help bring the wreaths from inside the fort to the cemetery and place them in front of the headstones in a patriotic commemoration on Dec. 15. King said additional details will be announced soon. For more information, contact King at Fort Ontario, phone 315-343-4711, or follow the Fort Ontario Facebook page at https://www.facebook.com/FortOntario/. Wreaths Across America is a 501(c)(3) nonprofit organization founded to continue and expand the annual wreath-laying ceremony at Arlington National Cemetery begun by Maine businessman Morrill Worcester in 1992. The organization’s mission – Remember, Honor, Teach – is carried out in part each year by coordinating wreath-laying ceremonies in December at Arlington, as well as at thousands of veterans’ cemeteries and other locations in all 50 states and beyond. 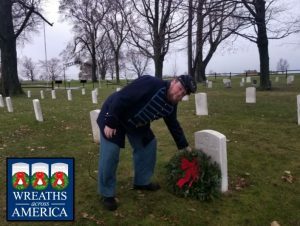 For more information, to sponsor wreaths or to sign up to volunteer, please visit www.WreathsAcrossAmerica.org. Follow Wreaths Across America on Facebook at http://Facebook.com/WAAHQ and on Twitter at http://twitter.com/WreathsAcross.